“Organizational relationships are complex. Emotional intelligence is the skillset we need to navigate and build effective teams”. No amount of work will ever feel as draining and challenging as an abrasive, bossy, self-centered leader. Then there’s the leader who can be fairly nice to the most of them but insert them into a situation where there is stress or conflict and their shadow side turns them into a scary monster that no one wants to be around. If you’re a leader who is gracious enough to admit you need to change, there’s good news – you can change and be viewed as an inspiration to those around you. A real inspiration – not the kind where your employees blow smoke up you’re a$$ just to keep their jobs. That change is delivered through a healthy and consistent dose of emotional intelligence. IQ vs. EQ - Which One is More Important? Long has IQ been considered the single, most important parameter of one’s success in life and at work. However, today’s experts recognized that, while high IQ is beneficial for one’s academic, work and life success, it is not crucial. As explained by Kendra Cherry in her verywellmind.com article “IQ or EQ: Which One Is More Important?”, it is true that “the concept of emotional intelligence has had a strong impact in a number of areas, including the business world. Many companies now mandate emotional intelligence training and utilize EQ tests as part of the hiring process. Research has found that individuals with strong leadership potential also tend to be more emotionally intelligent, suggesting that a high EQ is an important quality for business leaders and managers to have”. Why Does Emotional Intelligence (EI/EQ) Matter in the Workplace? To work successfully with others, you must be able to read and understand their expectations, and act in a way that nobody's sensibility, intellect, and ambition are compromised. In the 21st century workplace, social intelligence, self-awareness, and emotional intelligence of both leaders and the employees play a crucial role in creating the most respectful and productive work environment possible. According to the company 6seconds, emotional intelligence in the workplace is, not a nice-to-have, it’s a must-have. Healthy levels of EQ in a leader improve relationships, effectiveness, influence, and decision making in the workplace all while keeping everyone’s quality of living healthy. Emotional intelligence helps “organizations reap the benefits of EQ when they go beyond “training” and integrate the competencies into operations and use it to shape culture”. So, there’s that - in a nutshell. 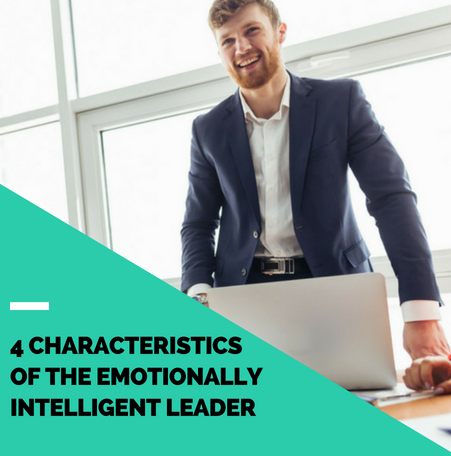 To help you navigate the world of EI/EQ, I’m sharing four characteristics typical of every emotionally intelligent leader. If you’re looking to increase your likeability factor, improve your connection with your team, and become a better leader, keep these in mind. No matter how hot your new strategy is, how popular you are in the business community, or how relevant you are in your industry; you won’t gain respect by treating people like they are not relevant. Whether they are veterans with 10+ years of experience, or new kids on the block looking to learn from you, be respectful of their ideas, effort, and suggestions. Even if you disagree with them, you still need to make an effort. Otherwise, don't expect them to respect you. Great leaders don’t demand respect because of authority, position or knowledge. They exude it in their daily actions and offer it in copious amounts. They also offer it to everyone. Ever encounter a leader who is only nice to people of importance? Or one that is full of smiles and pleasantries when interacting with someone who might be able to further their goals? Ever talk to them and sense they are being condescending and belittling you? Emotionally intelligent leaders don’t do this. They offer respect because they believe people deserve it, not solely because respect buys them favour. A narcissistic boss (aka egomaniac) is the type of a person who continually (and actively) overemphasizes their importance, expertise, talents, and capacity to multitask and handle teams/individual employees/projects/activities/etc., while making everyone else around them feel inferior and worthless. They don’t tolerate criticism or dissension and want their wishes attended to immediately. Paradoxically, the society tends to view these types of bosses as “ruthless, successful, and goal-oriented”, completely neglecting the toxic aspect of their personality. Unlike narcissistic bosses, emotionally intelligent leaders have the capacity to detach themselves from the situation, admit when they went overboard and create a team that doesn’t make people work FOR but WITH him/her. Everyone’s allowed a tantrum or two per year, but there is a difference behind occasional outbursts and a behavioral constant. When you know your importance inherently, you don’t feel the need to seek an external ego-boost either from your employees or your immediate private circle. A healthy self-awareness is making you much more worthy as a person, and a more capable leader. People tend to identify with their professions, which usually leads to developing an emotional and unrealistic attachment to both their positions and the people they work with. It is not uncommon to have bosses assume that every wrongdoing of their employees, every error or a “disobedient attitude” is intended to undermine their authority or is done to anger them. 99.99% of the time they're delusional. With so many things to do in a day, who's got the time to plot stuff? After all, mistakes happen, and that argument alone should do it. Emotionally intelligent leaders are smart enough not to let assumptions run their game. They are capable of differentiating reality from supposition, making them perfectly capable of running a team without being biased or difficult. *Ascribing intent is when things aren’t about us, but we assume they are. In the 21st century, jobs are no longer jobs - they are our ID cards. They are the first thing we think of or talk about when someone asks us about ourselves. As pointed out in Brianna Wiest’s article for Forbes, 7 Things Emotionally Intelligent People Don't Do At Work, “People are sensitive about work in the way they are sensitive about money.” Understandably, “this leads to a lot of self-consciousness, fear, and projection,” all of which can be problematic for how we interact with the people we work with. Work occupies a huge part of our self-identity so the moment someone tries to question what we do, or worse - examine our entire management style, we take it personally, and let our distressing emotions get the best of us. It potentially results in some unpleasant situations, confrontations, resentment, biased feedback, backstabbing, and so many more unfortunate circumstances. It also makes the workplace extremely dysfunctional and unsafe for the people on the receiving end of the leader’s wrath. Emotionally intelligent leaders know not to take things to heart. If anything, they try to read every comment as constructive criticism, an honest joke, or a moment of learning. Why? Because when you are emotionally intelligent, you understand that a) everyone’s entitled to an opinion b) not everyone has to like your management style c) your self-worth shouldn’t be attached to someone else’s definition of you. Emotional intelligence plays one of the crucial roles in a workplace, primarily when we are entrusted with the privilege of being in a role of leadership. Leadership requires effort and ownership. If you do your best to focus on your people skills and your emotional intelligence, you are guaranteed to become a more inspiring human. One that is loved and respected by choice, not out of obligation. P.S. If you’re curious about your EQ score, reach out and I’d be happy to help you determine where you stand, and what areas need improvement. Simone Brown is a performance coach who helps leaders and teams increase productivity. Her approach is grounded in behavioral and brain-based strategies. She believes success isn’t just about talents and smarts, it’s about the development of emotional intelligence. Simone is also a speaker, and talks about topics such as emotional intelligence, millennials, and the importance of purpose.